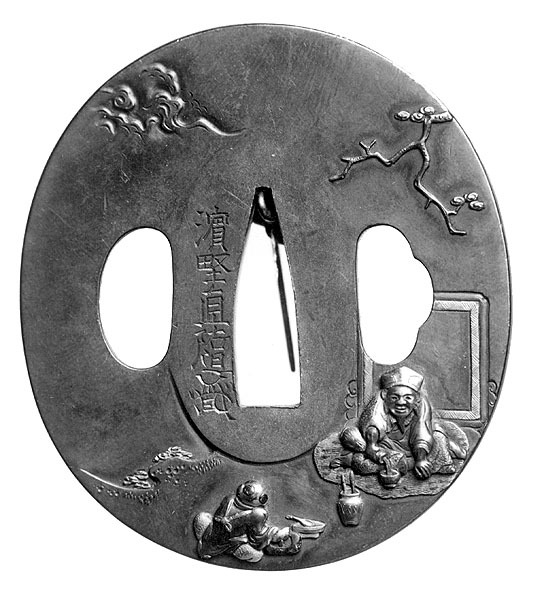 Description: tsuba, Tsuba of a wakizashi-shibuichi-oviform-Maker: Shozin-about 1765. Obverse: In recessed relief (shishi ai bori) amidst swirling clouds, the Buddhist diety Idoten in medium relief (chiu niku bori) is shown in martial clothes of shakudo and gold (kin). His face and hands are of copper and his halberd is of silver (gin) and copper. He is shown chasing a demon (oni) who is of copper with horns and eyes of kin and is holding a lamp and hiding from the storm. Reverse: Storm clouds and large waves with spray of kin. Shakudo rocks and plants of kin. Description: tsuba, Tsuba of a wakizashi-shibuichi-oviform-Maker: Shoji Noritoshi-19th century. Obverse: Two acolytes of the Buddhist Fudo-Divinity of water falls. They are shown among swirling clouds, a waterfall of fine lines (kebori) and scattered plants of flat inlay (hira zogan) of gold (kin). One acolyte is of silver (gin) with some kin inlay is carrying a lotus (hasu). The other is of medium relief (chiu niku bori) with body of copper and clothing of gin with kin inlay. Reverse: waterfall seen through openings in swirling clouds and scattered plants. Description: tsuba, Tsuba of a wakizashi-shibuichi-oviform-Maker: Naoyuki or Chokuzui(? )-late 18th century. Obverse: An old man (possibly Daikoku because of the oddly shaped hat) seated on a tiger (tora) skin. The tora skin is of stripes of shakudo and flat inlay (hira zogan) of gold (kin). The figure of the man is of shakudo in medium relief (chiu niku bori) with clothing of hira zogan of kin. He is pouring a liquid into a kin bowl and there is a kin pot nearby with two brushes in it. Behind him is a screen edged in kin. Before him sits a boy in chiu niku bori of shakudo with kin pants. He is grinding ink. Above, suggesting brush strokes (kata kiri bori), is a cloud. There is also a plum tree (ume) branch. Reverse: Mountain stream in recessed carving (shishi ai bori), rocks, plants of kin hira zogan and ume tree with kin blossoms. 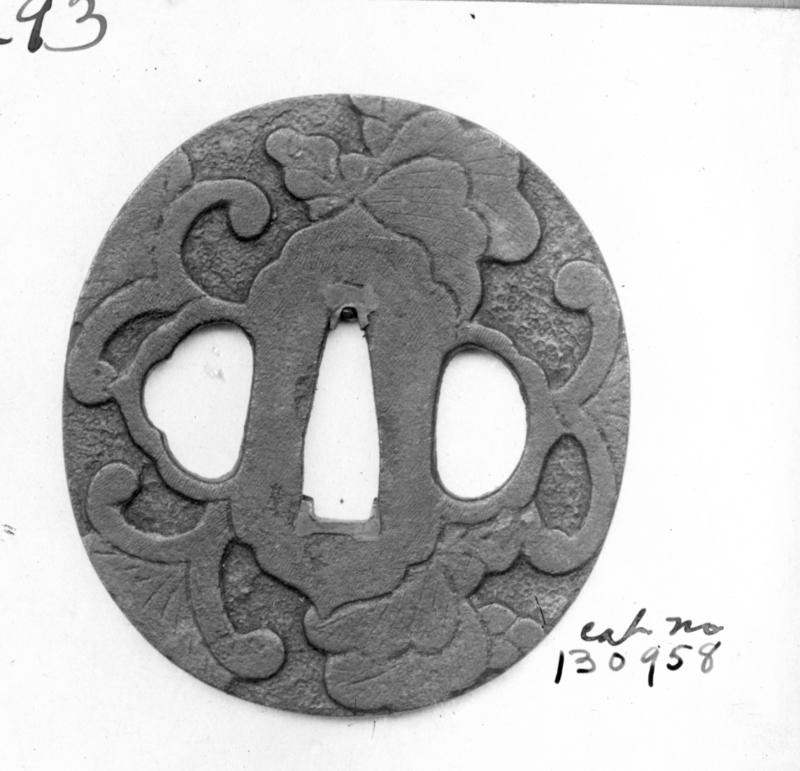 Description: tsuba, Tsuba of a katana-iron-oval-l9th century Obverse and reverse: All over floral design in low relief (usu niku bori) of leaves. Background has a hammered bead-like design. May have originally been covered with silver (gin) (crosshatching visible). 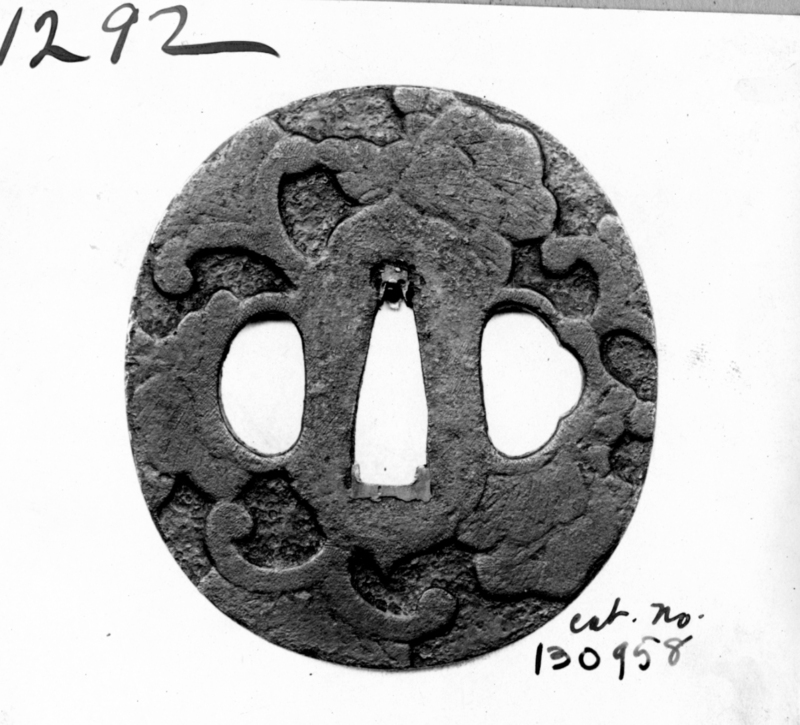 Description: tsuba, Tsuba of a tachi-iron-square with rounded corners-l8th century. Obverse: Possibly some of the eight beautiful views of Lake Biwa. All in low relief (usu niku bori) - the autumn moon seen from Ishiyama, the bell of Miidera, boats sailing from yabase. Sailing boats returning home. Reverse: A bridge in usu niku bori. Some brass is still visible.